Unable to pay rent, thousands of families were evicted from their dwellings. It’s not like people lived in middle-class housing. Most homes were hovels with thatched roofs. 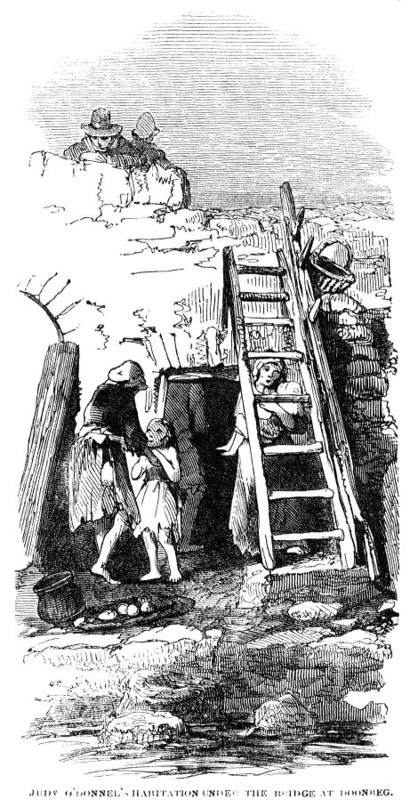 Two wretched families have taken refuge under the bridge [at Doonbeg] in a hole. They consist of two widows, one with three children, all ill of jaundice, and the other with five. The history of Judy O’Donnel, one of the widows, is worthy of being sketched. She had given evidence against a dishonest relieving officer whose relative was a driver upon the estate on which she lived, and Judy’s house was very soon afterwards levelled with the ground. The wreckers came upon it in her absence, when her son gallantly defended his home. He mounted on the roof with a bag of stones, and kept the enemy at bay till his ammunition was exhausted, when he was obliged to give in, and stand by to see the little furniture of his mother cast into the road and the house pulled down. Judy exhibited her receipts for the rent up to the last gale; and she declared the agent of the owner, to whom she had tendered what was due twice, had refused, and that she was ejected because she deposed against the dishonest public servant. ...and his ancestors resided on this spot for over a century, with renewal of their lease up to 1845. He neither owed rent arrears or taxes up to the present moment, and yet he was pitched out onto the roadside, and saw then other houses, with his own, levelled at one fell swoop on the spot...None of them were mud cabins, but all capital stone-built houses. If people who owed no back rent were evicted, what would happen to people who did? Whole families were thrown out and, like Tim Downs, were helpless as they watched their erstwhile shelters become heaps of rubble. Mud cabins and stone houses were rammed by their owners to make sure tenants couldn’t come back. Places that had given families refuge from the cold were burned to the ground. Starving people with their possessions on their back, walked with their children to nowhere. Many dropped dead on the roads. Poor houses were filled beyond capacity. Mansions of the wealthy were flooded with needy, starving, homeless families. Mothers begged for food for their children. Other first-hand accounts would vehemently disagree with that conclusion. Bos, Carole "EJECTED, STARVING PEOPLE in IRELAND" AwesomeStories.com. Jan 01, 2002. Apr 26, 2019. Do We Have an Obligation to Care for Widows and Orphans?